Demo day got under way and soon this dated property will be a relaxing retreat for guests. Watch over the next few weeks as we renovate and update this great florida keys home. The initial design process started 3 months ago with meetings and design themes developed. Spring has sprung and like the newness of flora peaking out from the ground, it’s time to rejuvenate your spaces with bright colors and new ideas. Meryl Streep’s popular line in The Devil Wears Prada went something like, “Florals for Spring? 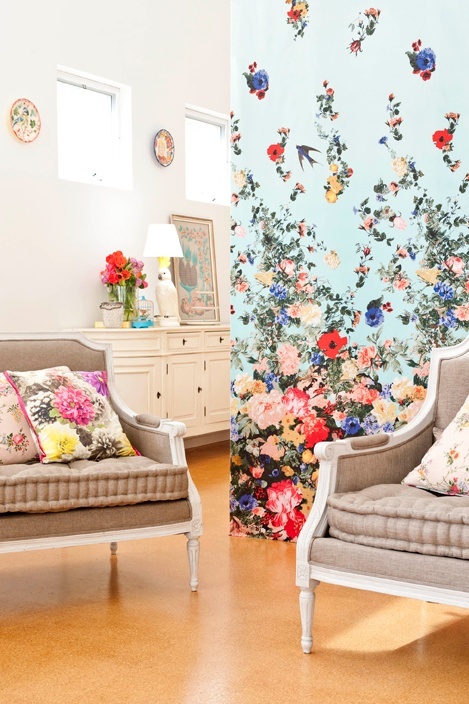 Groundbreaking.” As much as we designers love to brainstorm different ideas, a floral theme is a staple for decorating in the new season and it doesn't have to cover an entire sofa. A few throw pillows can be just enough to bring a room to life after a cold winter -- or in our case here in Florida -- a luke-warm one. 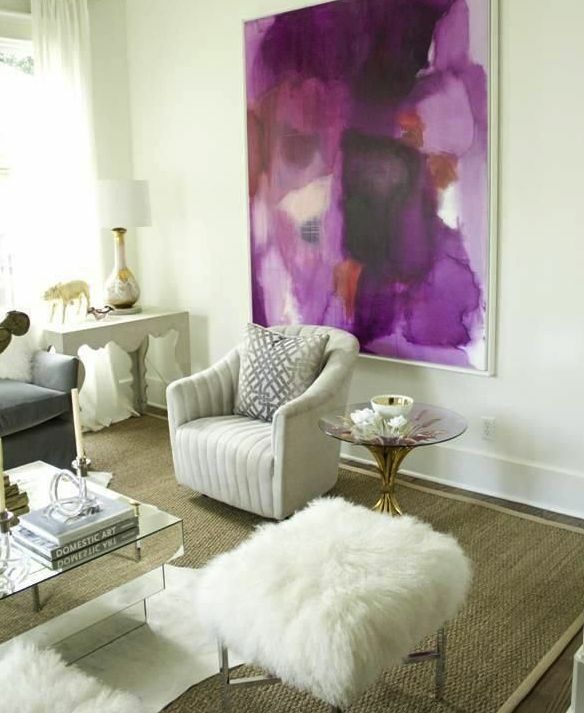 It’s also the right time to remember to incorporate Pantone’s color of the year: Radiant Orchid. This gorgeous shade of purple with fuchsia and pink undertones can be brought to life on your dinner table or in your living room in the form of accent pieces and artwork. 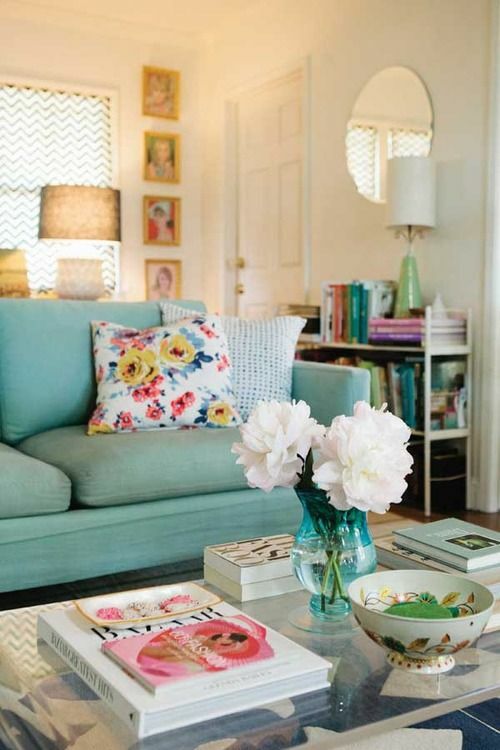 A big trend this year is to add dashes of color to an otherwise neutral room. 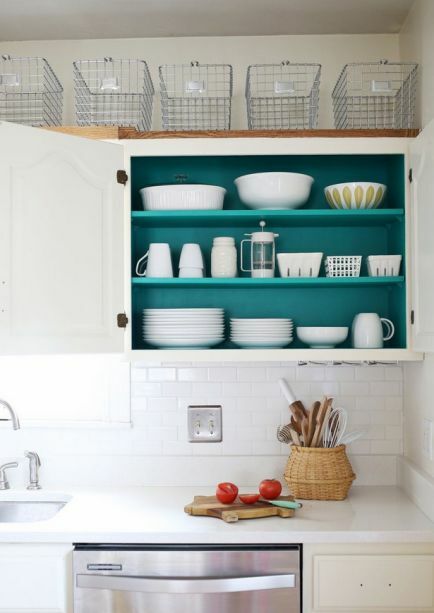 For example, painting the interior of a kitchen cabinet with a contrasting turquoise brings about an interesting contrast. The lime green accents in the living room, shown in Veranda Magazine, bring a sense of freshness and life to a neutral pallet and can easily be changed out for other colors when the season passes. And of course, we love getting back to our roots with the coastal laundry room. We love that appliance manufacturers are now thinking about color as well and the bright blue of the stackable washer & dryer in combination with the rug and fresh flowers is nothing short of eye-catching! Spring is all about using color to brighten up and cheer up a room, but color is not the only option in adding a little liveliness. Patterns can be just as fun and stimulating, especially in the form of wallpaper, as these examples clearly show. Our favorite trend for spring, however, is the return of brass. 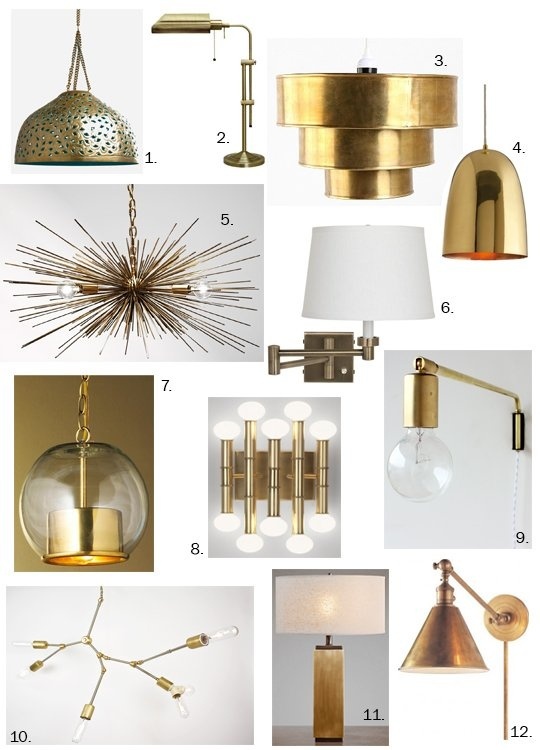 We really love some of these cool brass lighting options as seen on Apartment Therapy. Also, be sure to check out the stunning faucets from the pages of House Beautful! Whatever you decide to do this spring, don’t be afraid to step out of the box and play with new colors! Here in Palm Beach, we often get caught up in the new-ness of everything. With new homes being built and new design ideas popping up everywhere, we tend to forget that beauty can be found in the old and vintage. New pieces are beautiful, but add a family heirloom and it now becomes personal. If our previous blogs were any indication, we’re very big on going green and creating sustainable design and what that comes down to is the basics: reduce, reuse, and especially recycle. And what better way to recycle, than to take the old treasures and mix them in with the new? Some of the most beautiful designs come from adding antiques to a more contemporary space. Take for example this kitchen. Where it’s modernity includes the stainless steel appliances and open space, it’s balanced with an earthy, antique look from the table and chandelier and gives the room a warm, cozy feel. We love this kitchen in particular because the floor is very retro while the countertops and appliances are clean and contemporary. Whatever you choose to do, it’s important to remember that mixing and matching the old with the new can create something unique and give you a reason to use that old rocking chair that was passed down to you by your grandmother. Don’t be too quick to throw away an item that could be used to add to a vintage appeal to a room. We recently had the pleasure of attending a Duralee presentation at the Designers’ Buying Group in Jupiter, FL, in which Eileen Kathryn Boyd, a designer for Duralee fabrics, discussed the process of creating new fabric designs. We gained an entirely new perspective on the process and appreciate all of the work that goes into preparing a new line. Eileen saved paintings and ideas for 15 years before approaching Duralee about creating a line. With 20 years of experience, a Fine Arts Degree, and 15-20 completed showhouses, she understood fabrics from a designer’s perspective as well as an artist’s. Hers became the first Duralee licensed collection. People sometimes get so involved with the way a fabric looks; the color, the pattern, the repeat, that they underestimate the importance of the way a fabric feels. It was interesting to hear that the first thing Eileen did when sorting through a myriad of fabrics that were presented to her, was to close her eyes and touch all the fabrics. They had to meet all the senses. Many of her designs are influenced by what she finds at textile shows. She buys pieces and pattern ideas that inspire her. From an initial piece, the fabric takes on a new life of its own. One example of this flourished from the contemporary inspiration painting of a flower. Eileen first took the flower and created a purple color scheme around it, then added a leopard print to the background. Finding further inspiration from a Warhol painting, she outlined the flowers in a particular fashion. The end result is a fabulous pattern that will debut later this year, in July. To Eileen, the process is very artful. It involves a lot of back and forth between she and the design department, and lots of tweaking, “like cooking,” she explained. Here are a few of Eileen’s designs from her first collection. You can get an idea of which memory pieces carry through the fabrics. She’ll be taking some inspiration from her previous line when her next one debuts. We look forward to see all of the new patterns! How to create a warm and welcoming home to entertain this Holiday Season. It’s best to welcome guests into an open part of your home where there isn’t too much furniture making the room look cluttered. Allow the guests to have space to move around and mingle with a few options for those who prefer to sit. One of our favorite accents for a welcoming home is the bar cart. We found this creative idea on Pinterest and it's a great way to spruce up a room and add a little holiday touch. 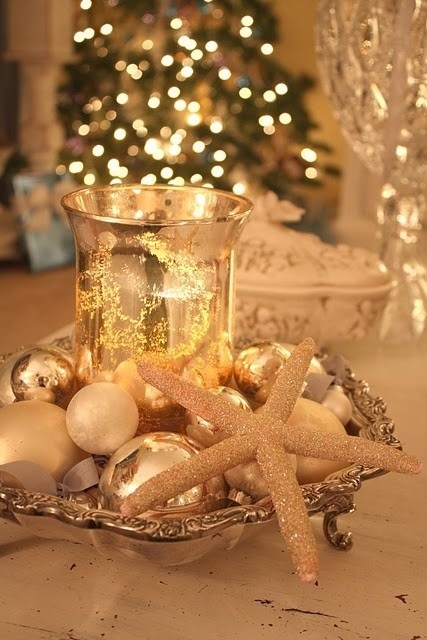 This is a pretty way to add a little sparkle to your tropical Christmas decor. Lanterns are also a simple touch to warm up a room and they can be found at just about any craft store. Here in Palm Beach, it’s still pretty warm outside, so a great place to entertain guests is the backyard. Try wrapping trees with Christmas lights or hanging lanterns from them to create atmosphere. If you're welcoming guests for an overnight stay, remember to provide them with a comfortable space to live in. One great idea we got from Martha Stewart is to keep a matching pile of towels folded and tied together with a ribbon. That way, before the guest arrives, you can simply pick up the towels and place them in their room. Similarly, make decorating a breeze by touching up your guest's room with stationary. Not only may it come in handy, but it's an excellent way to bring in a winter theme or something seasonal into the room. Whatever you choose to do, remember to have fun with it. Happy decorating! Bring the outdoors in for a simple, but elegant table setting. The great thing about decorating for the holidays is that we can always stick to what is familiar to us - how our mother decorated - or we can get creative and add a touch of our own personality and life to the design. Here’s an interesting way to spruce up a table setting for Thanksgiving with just a touch of something different… Gold pumpkins! You can always go for a more modern look with these gorgeous square dishes with silver accents set against the traditional orange. We’ve given you a few ideas, but it’s always fun to come up with your own. Play around with a mix of modern and traditional and make your Thanksgiving dinner something to remember! When we hear the words, “beautiful interior design”, it evokes an image that can vary greatly from person to person. It could be a wide-open space with clean lines and modern design elements or perhaps something more traditional and ornate. It may even have a nautical or coastal flair. Whatever your idea of beautiful is, have you ever considered that it could be so much more than just aesthetically pleasing? Yes, design can be beautiful, but it can also go above and beyond that by incorporating non-toxic and energy efficient products into the plan. By doing so, you can improve your indoor air quality and create an eco-friendly, healthy home. By the way, those energy efficient products that you use can also save you money over time!! That’s what Sustainable Design is all about.